Unfortunately this is not the first or last time McConaughey will have a set of balls in his mouth. Maybe he is caddying for Tom Cruise.."Hey Mathew..my balls in your mouth is just part of the job". but for real though. is this man gay, because i used to hear mumblings, but i didn't know if they were true. are you being funny, or telling us something? Is he trying to promote his next movie. "Broke Back Golfing" ? This man is a GOD. It doesn't matter what he's doing or wearing or saying. To us it does. 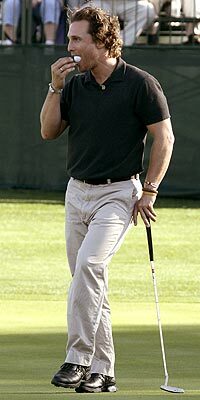 We need to know why McConaughey stuffed a golf ball into his mouth during a celebrity golf tourney viewed by millions. How does he have more hair than he did in his 20s?